Scraped-Surface Heat Exchanger | THERMO Spoken Here! As ammonia (blue) passes through the outer annulus it causes the juice to freeze to the inside wall of its path. The scraper, rotated by a motor, forces the liquid/solid concentrate to exit upper left. Calculate the least steady mass rate of ammonia required by the device. ♦ The system will be the orange juice approximated as water and the ammoonia. 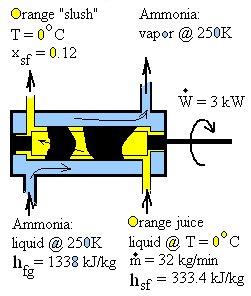 The OJ enters as liquid and leaves, part solid-part liquid. The proportion is given by the exiting quality, xsf (where s means solid and f means liquid). Quality is the ratio of the mass of the "higher energy" phase divided by the mass of both phases present. The order of energy among phases is: gas - greatest, next liquid and least energetic is the solid phase. We check this equation again. Of the properties to enter, ammonia ia the easier. The ammonia changes phase from liquid to vapor so "in" is liquid (f) and "out" is vapor (g). The water enters as saturated liquid. The exiting flow is 88% solid and 12% liquid. Again, our numbers are approximate. The very cold temperature will enhance heat from the surroundings.